2013 marks the third year of the Federal Data Center Consolidation Initiative (FDCCI) and inches agencies closer to its shared 2015 deadline with the coinciding Presidential Memorandum; disposing of unneeded federal real estate. The initiative itself has primarily been unfunded with the hopes that the consolidation of federal data centers would ultimately generate savings that would allow agencies to fund and move forward with additional consolidation plans. 2013, to say the least, has been the most challenging year thus far with shrinking budgets from appropriated funds and more specifically sequestration. The topic of alternative funding gains renewed interest during these challenging times, but few in IT are aware of some of the available and proven contracts available to federal agencies. Energy Service Companies (ESCO’s) and the Department of Energy have advocated the use of Energy Savings Performance Contracts (ESPC’s) for Data Centers. A few projects have emerged in the past year, some of which are viewed as pilots, but we have yet to see wide scale adoption. In light of FDCCI and the current fiscal environment a significant opportunity for IT is being missed. ESPC’s allow federal agencies to conduct energy projects with no upfront capital costs, minimizing the need for Congressional appropriations. The projects are designed and constructed in a manner that meets the agency’s needs and the ESCO arranges the necessary funding and guarantees that the improvements will generate energy cost savings sufficient to pay for the project over the term of the contract. A large majority of federal agencies have utilized this contract to improve the performance of buildings, however, data centers have not been addressed in most of the past contracts. The barriers to performing ESPC’s on data centers are easily solvable and the first step is to educate. In a recent meeting with a federal CIO, I put the opportunity in the context of visualizing energy as an asset. Every dollar saved on your energy bill can be leveraged into improving and/or consolidating data centers and implementing efficient IT. In addition, education can dispel misnomers of what ESPC’s can be used for. When speaking with federal IT managers and asking about their awareness of ESPC’s, their association generally relates to infrastructure improvements such as lighting, HVAC, etc., all of which are highly sought after benefits to an ESPC. However, rarely, if ever, have the dots connected back to an IT project that provides energy or operational savings such as Virtual Desktop Infrastructure (VDI), server consolidation or server virtualization. These examples are just a few of the IT projects that can drive not only energy savings, but operational savings as well. 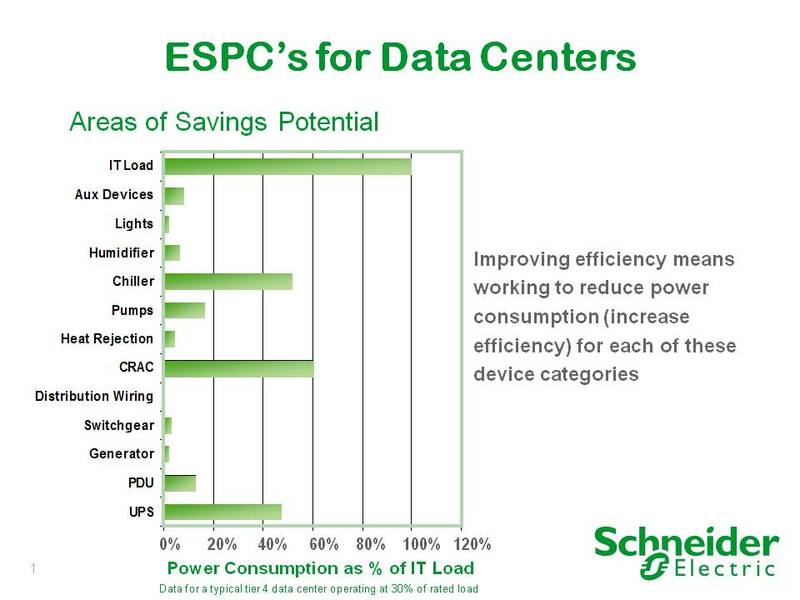 I will often show a slide during presentations on the topic of energy savings in data centers. It identifies the areas of savings potential as it relates to power consumption of a device as a percent of IT load. The low hanging fruit in the data center (CRAC/CRAH, Chillers, UPS, PDU Transformers) tends to get the most agreement from the audience, but the top of the graph, and the only category that reflects 100% (the IT Load) is rarely acknowledged. If Federal agencies hope to meet the goals of FDCCI, dispose of unneeded real estate and comply with energy and environmental legislation in a less than ideal fiscal environment, future ESPC’s must address data centers and include both infrastructure and IT. There is a hidden gem in nearly every router, switch, IPphones, printers, copiers (in other words, IT plug load). All of the major vendors (such as Cisco, Juniper) have energy agents in them. Companies such as JouleX have a management platform that optimizes the energy usage of these devices. What is perfect about this scenario is that those energy agents ARE ALREADY in place, so commissioning is a very easy, inexpensive process with immediate results. Thanks for your comments Joan! I couldn’t agree with you more. IT plug loads both inside and outside the data center can have significant savings with short term paybacks. 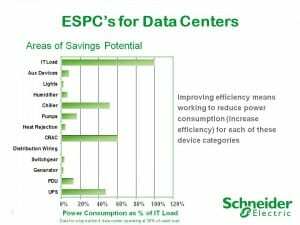 Including plug load Energy Conservation Measures (ECM’s) within ESPC’s for Data Centers are definitely an area that can improve the viability of the project and reduce the term of the contract.